Continued from Hayes family in Somerset. We had breakfast at 7:30, and left Pickford House at Beckington just after 8:00. We had had a very pleasant stay there for two nights. 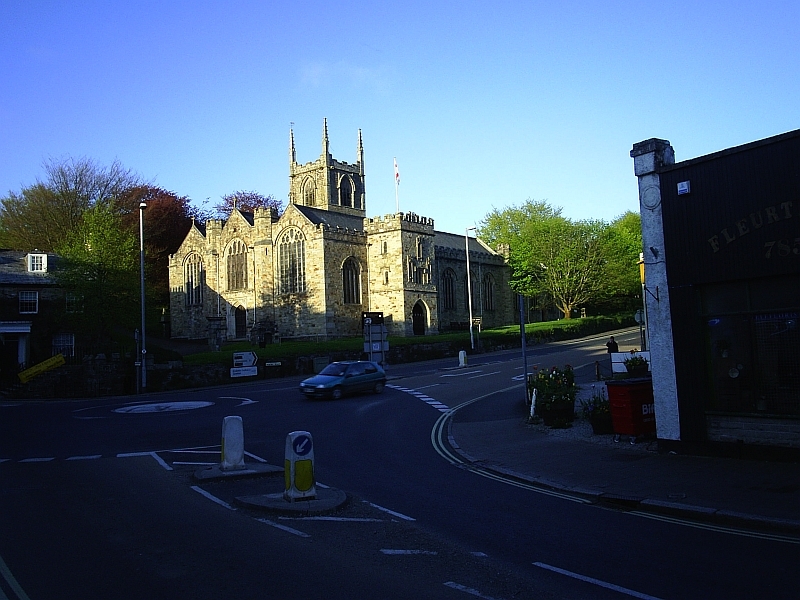 We drove through Midsomer Norton, because there was a TV detective series called Midsomer Murders. Midsomer Norton looked a rather unprepossessing place, and it turned out that the detective series was filmed in Oxfordshire anyway. We drove down the Cheddar Gorge this time, and went to the post office in Axbridge, where we bought post cards, pens and stationery. 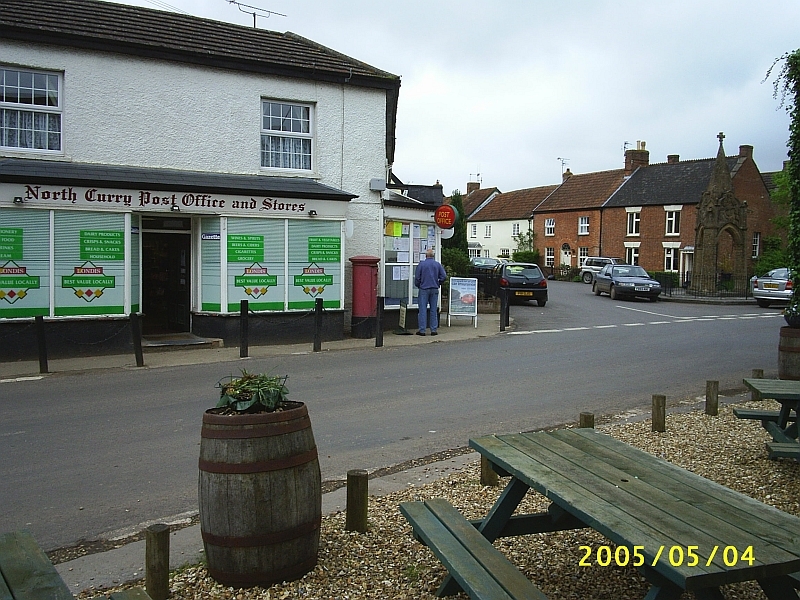 We drove up the High Street and round the village. There was a field full of Somerset sheep, which seemed fatter than the Merinos at home, and at the other side of the field there appeared to be two llamas lying down, but they were so far away we could not see them very well. We called at Wookey Hole, but did not go in to the caves. We drove through Glastonbury, and saw the Tor, which was not nearly as numinous and mysterious as it has been touted to be. We had read in many places that it was supposed to be spooky, and one of the “thin places” of the earth, but it looked quite ordinaryas we drove past. Nearby we passed a sign to Burrowbridge Mump, and we wondered what a “mump” could be — something like a tumulus or tump, perhaps? We saw a roundish hill off to the left, and assumed that that was it. Then we drove along a narrow road across the Somerset flats, lined with basket willows, and turned off to the left, and after about a mile climbed up to North Curry, where my great great great grandfather Simon Hayes was born about 1785. The sky was overcast and there was a chilly wind blowing. From the hill there was a view a long way over the Somerset Levels. We went to the church, and when we got out of the car we heard the sound of the wind blowing in the trees and the raucous cries of strange birds. That was numinous and mysterious, far more so than Glastonbury, and had a rather menacing atmosphere. The harsh cries of crows, and some that sounded like owls made it feel somehow unearthly. It was what H.P. Lovecraft might describe as eldritch. The church with its octagonal tower was grey and crumbling and covered with lichen, and looked like an abandoned building from Elidor, something from another time and place. If you are talking about thin places, this was the thinnest place I had ever been in. St Peter & St Paul Church, North Curry, Somerset, 4 May 2005. Inside the church was also rather impressive, in a somewhat different way, and it seemed to be a lively and active parish. There was an ikon of St Peter & St Paul, and we lit candles in front of it. 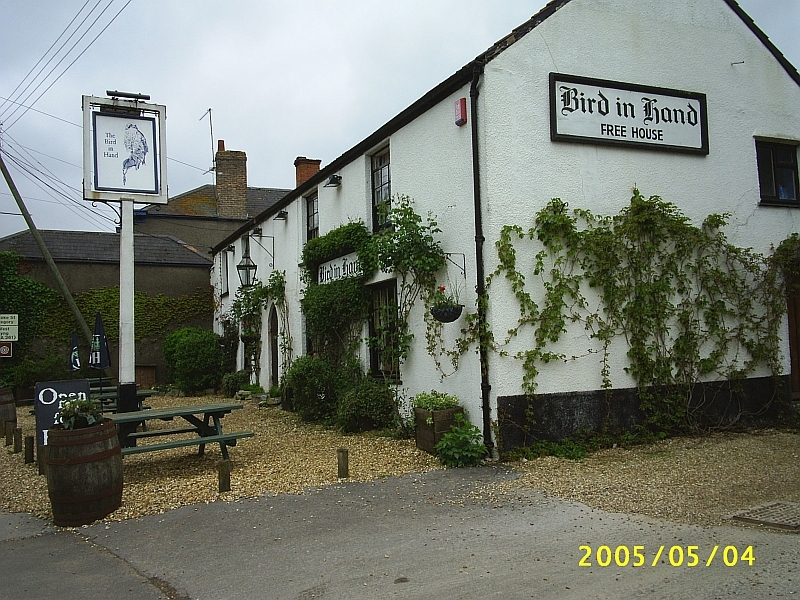 We had lunch in the Bird in Hand pub, ham eggs and chips, which was expensive, but much better than English food as I remembered it from 40 years ago. In Bath we had gone to a Chinese restaurant, because of my memories of the banality of English cuisine. This was a surprise, and as we continued on our travels we discovered the cooking much better than it had been in the 1960s; perhaps it was the influence of all the cooking shows on TV that seemed to have proliferated in recent years. The inhabited parts of the village were not nearly as spooky as the bits around the church. 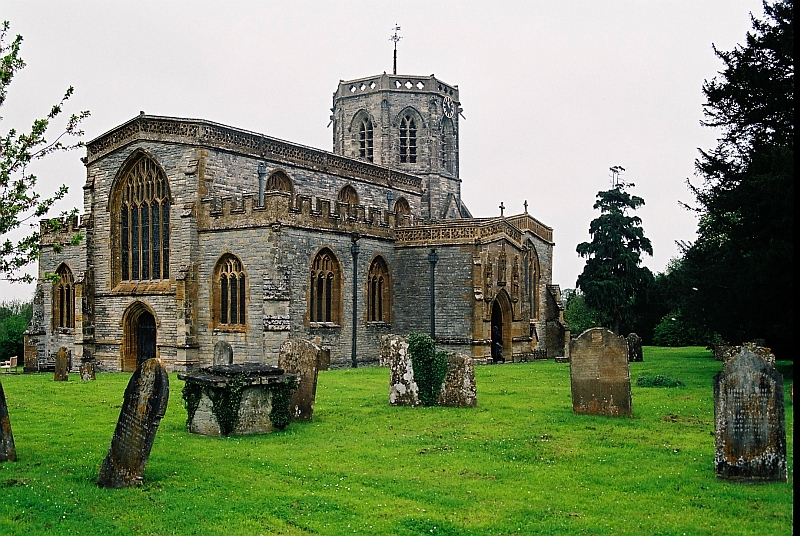 Though my ancestor Simon Hayes claimed to have been born here, there was no record of his baptism in the church records, and he appears to have dropped into the world out of nowhere. Perhaps he was a refugee from Elidor. 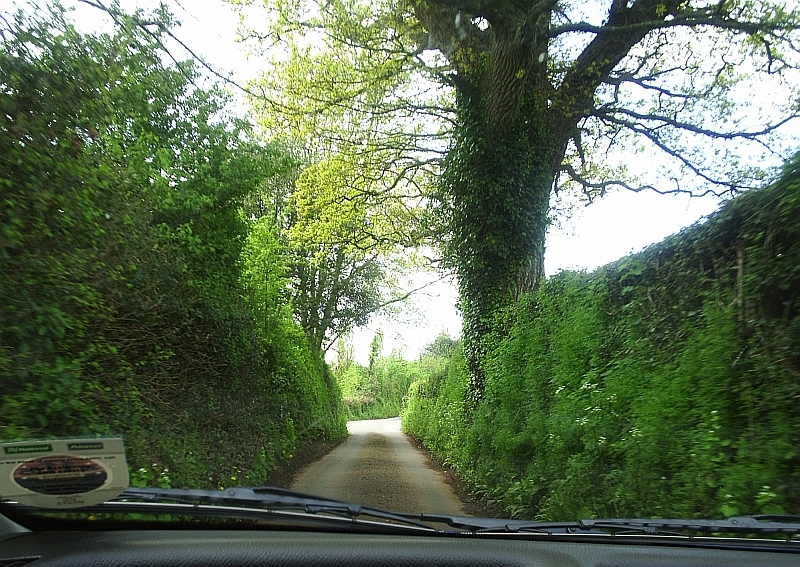 the sun came out again as we drove down narrow country lanes with high banks and hedges, so one could see very little other than the narrow sunken lanes ahead. Devonshire lanes near Dunchideock, with high banks and hedges, and no view of the countryside. 4 May 2005.
at North Curry, and so were not hungry enough. We went on to Ashton in the Teign Valley, where the Stooke family had lived. 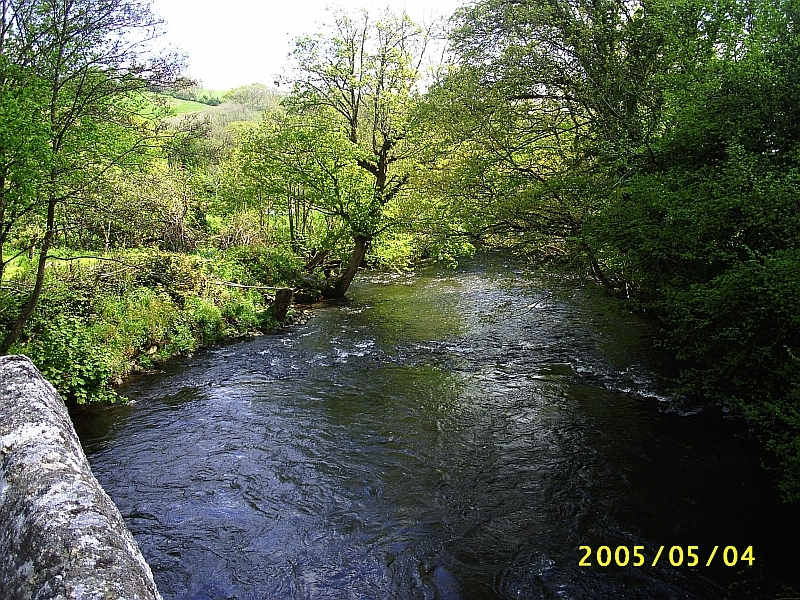 The River Teign at Ashton. 4 May 2005. My great grandfather William Allen Hayes had married Mary Barber Stooke in Bristol, and then run the Red Lion Hotel in Axbridge. The Stooke family goes back to the 16th century in the Teign valley. Ashton church seemed much deader than the one in North Curry, and was locked. Ashton parish church, Devon. 4 May 2005. 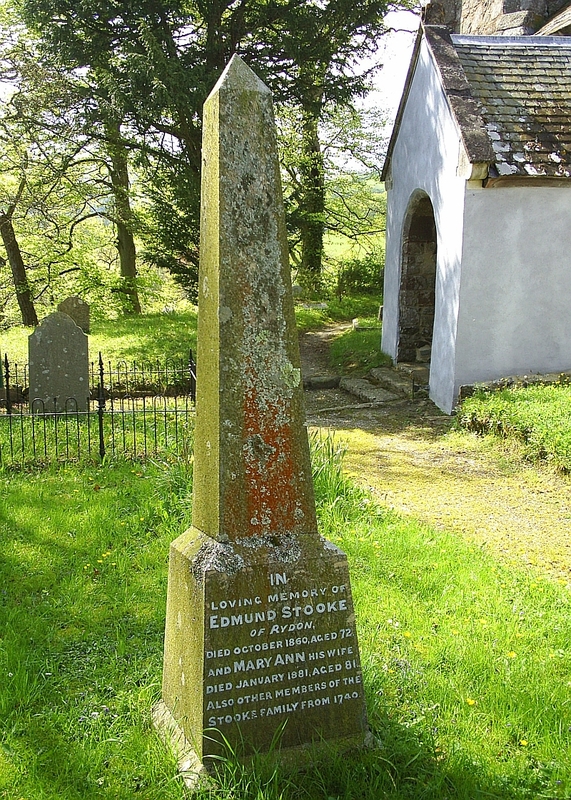 There was only one monument to the Stookes that we could find in the churchyard, that of Edmund Stooke of Rydon (1788-1860). He was the uncle of my great great grandfather Thomas Stooke, who was born in Chudleigh in 1815. Monument to Edward Stooke of Rydon in Ashton churchyard. 4 May 2005. 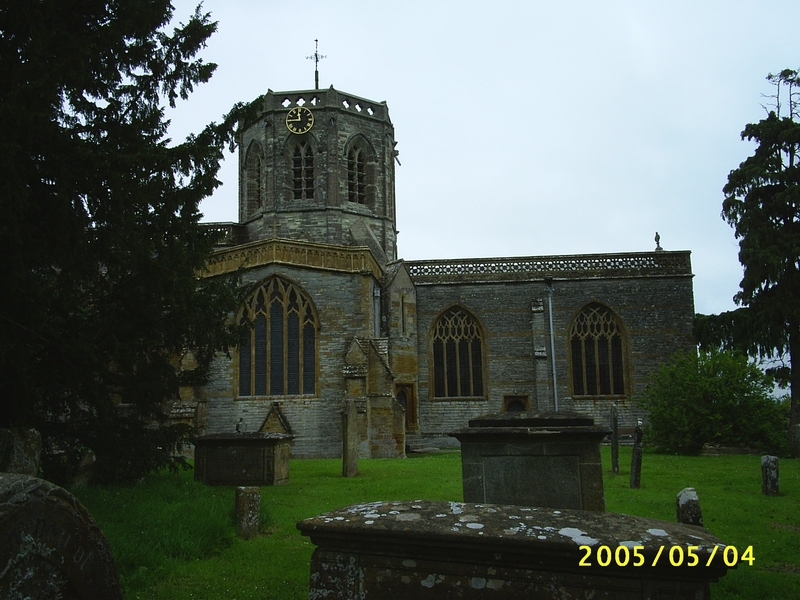 We then went to Trusham, where Stookes had also lived, and the church was a bit better maintained, and there were monuments to the Stooke family inside the church. We spoke to a woman there who was looking after the church. Trusham village seemed to be a bit bigger than Ashton, and had more inhabitants. accents sounded like, but everywhere we have been we heard Estuary accents. 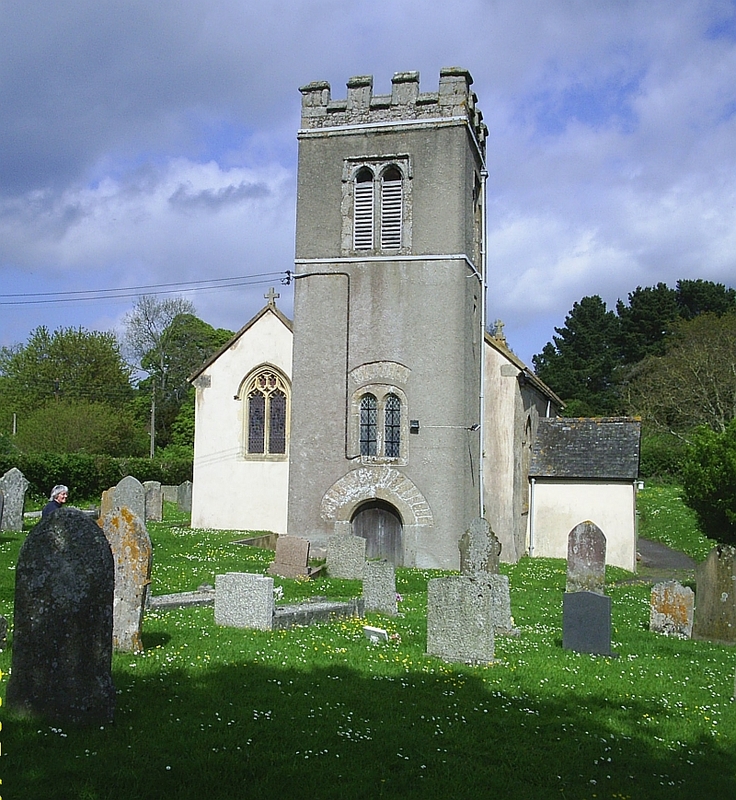 Chudleigh parish church. My great great grandfather Thomas Stooke was baptised here in 1815. 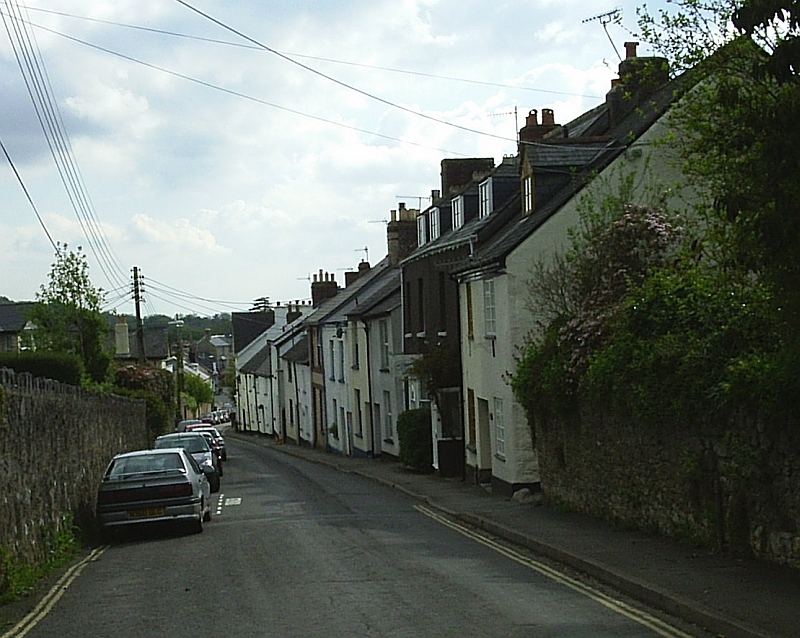 We then drove through Bovey Tracey, where a Stooke had been minister in the Commonwealth period, and on to Moretonhampstead, where I had nearly had a job as a kitchen boy in a hotel in 1966, and then across Dartmoor to Tavistock, via Two Bridges. Dartmoor looked a lot like the South African highveld. Dartmoor – resembles the South African Highveld. We drove up to the A30, and crossed Bodmin Moor and turned off to Blisland just past Jamaica Inn, and stayed at Trewint Farm near the hamlet of Waterloo, run by Mike and Carol. After dumping our cases we drove in to Bodmin, and had supper at the Weavers bar in the middle of town. They had Cornish steaks on the menu, but no Cornish pasties, so we had ham omelets. The town seemed noisy, with small motor bikes running around. After supper we drove around looking for places where the Growden family had lived at various times, and found Higher Bore Street, which was one of their homes. 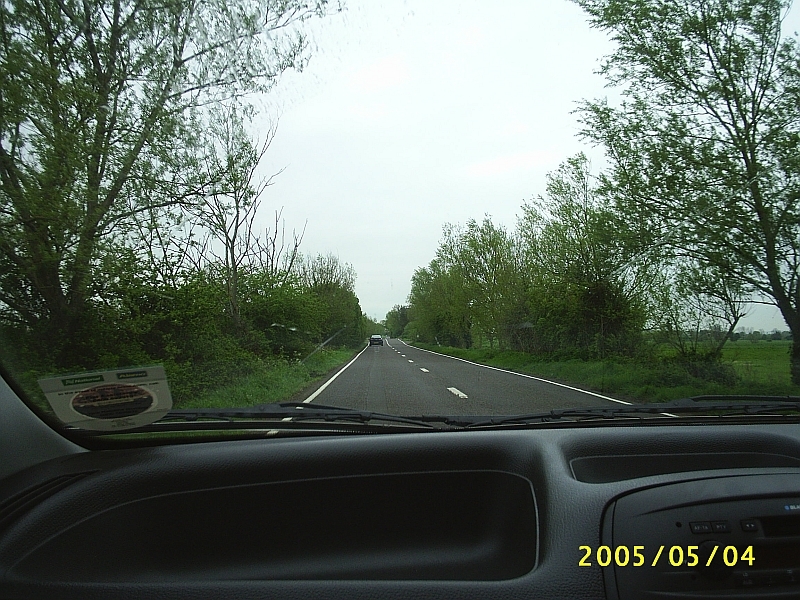 We drove back over the moor, though around Blisland most of the roads were narrow sunken country lanes with high banks and hedges like those in Devon, so we could not see much of the countryside. Continued at Bodmin Moor, Cornwall, on election day. I haven’t posted much in this blog for a while, and so was rather puzzled by a sudden flurry of new visitors yesterday, more than twice the daily average. The reason I haven’t posted much is that we haven’t made any startling new discoveries in our family history recently, but have just been plodding along. At around this time of the year (December-January) we seem to get back to the Stooke family, and this time around seem to have been adding to the descendants of John Stooke and Mary Barter of Kingskerswell in Devon. This is a bit peripheral to our interests, because I’m not 100%, or even 90% sure that they are related. 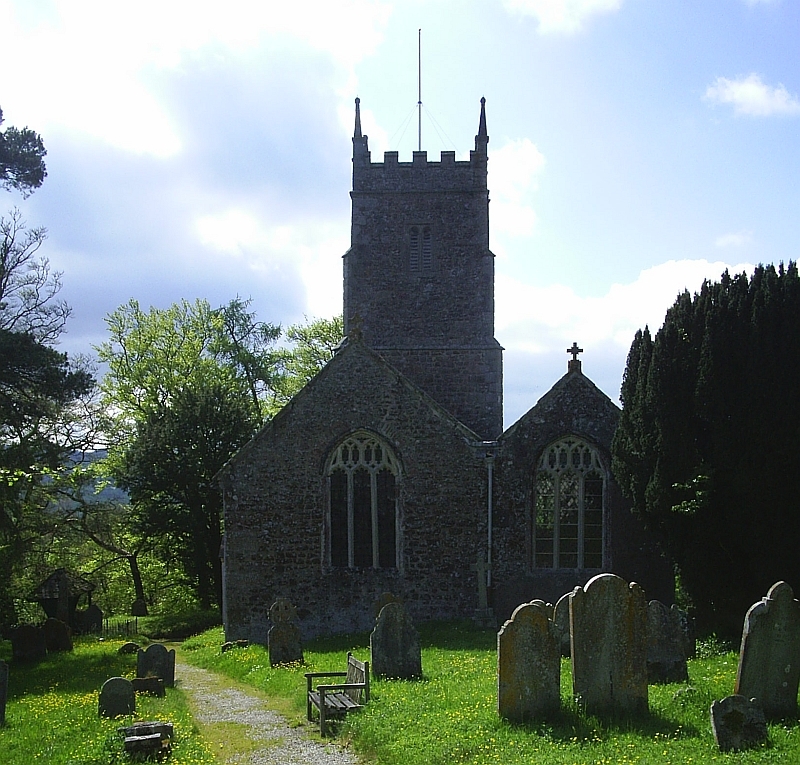 John Stooke of Dawlish married Mary Barter at Kingskerswell in 1808, and they had 10 children (that we have been able to trace), and we have been able to trace at least some descendants of five of those children. John Stooke was apparently born in Dawlish in 1784, the son of James Stooke and Mary Bargeron or Barjeron or Baragon or Barrigan (there seem to be a number of ways of spelling it), who were married in Dawlish on 28 October 1771. What is not clear is where this James Stooke came from. Some family trees identify him with James Stooke of Trusham, the son of Edward Stooke and Elizabeth Dingley, who was baptised in Trusham on 28 June 1742. While this is possible, it also seems that there were other Stooke families living in Dawlish at the time of the marriage of James and Mary, so it would be useful if we could see the Dawlish parish registers and do a reconstruction of all the Stooke families there. Unfortunately the Dawlish registers do not appear to be available online, either on FreeReg or anywhere else, nor do they appear to have been filmed by the LDS, so it would mean travelling to the Devon Record Office in Exeter to try to find them. I’ve also been scanning some old negatives, and came across some photos taken when we lived in Utrecht briefly. 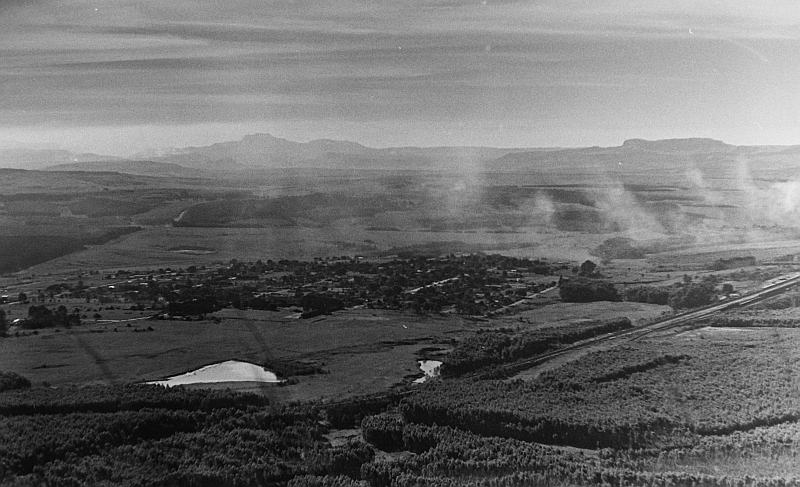 When we were living there we travelled actoss to Paulpietrersburg, some 70 km away over gravel roads. I knew that my grandfather, Percy Hayes (whose mother was Mary Barber Stooke) had lived there until he died in 1948, and he is buried in an unmarked grave in the cemetery there. He used to be the secretary of the Dumbe colliery, so we had a look at it, though in his day it was at the base of the mountain, and when we visited, nearly 30 years later, it was near the top. So we drove up the mountain, and took some photos of Paulpietersburg from there. I’ve only just discovered about the idea of blogging about Fearless Females in the month of March, and there’s a list of blog prompts, one for each day of the month, here, hat-tip to GenWest UK. Today’s theme is Is there a female ancestor who is your brick wall? Why? List possible sources for finding more information., and since GenWestUK, who gave me the idea, is in the west of England, I’m choosing a couple from that part of the, world too. The first one is Mary Barber, who was my great great great grandmother. She married Simon Smallridge Stooke in Hennock, Devon, England, on 11 December 1813, and that’s about all I know of her. Though, according to the 1851 Census of England she was apparently born in Hennock in about 1796, the Online Parish Clerk for Hennock, who kindly looked them up for me, said that the only Mary Barber baptised there was born in 1791. Perhaps she lied about her age on the census, so I’m not sure of her parents. Her husband, Simon Smallridge Stooke, was baptised in Ashton, Devon, on 4 May 1788, the son of Francis Stooke and Ann Smallridge. He was a farmer of Chudleigh, and he and Mary Barber had two sons (that we know of), Thomas and Francis. Simon died in 1828 at about the age of 40. The elder son, Thomas, went to Bristol and married Mary Harriet Hollins. The younger son, Francis, does not seem to have married or had children, but what happened to him is uncertain too — there is a possible death record for him in the 1840s. Our other brick wall there is Mary’s mother-in-law, Ann Smallridge, who married Francis Stooke at Ashton, Devon, on 26 June 1775. Actually she is not so much a brick wall as her parents, as we would love to know more about them. She was from Doddiscombsleigh, a village a couple of miles north of Ashton, and possibly the daughter of Simon and Elizabeth Smallridge of Doddiscombsleigh, where she was probably baptised in 1748. Well the world didn’t end on 21 December, but our ADSL router did — it was zapped by lightning on the evening of the 20th, and so we missed the momentous event, just when I was making some interesting discoveries about the Stooke family too. I seem to have lost touch with many of the people who were researching the Stooke family. Our biggest breakthrough came from Joyce Robinson in Victoria, Australia, who sent us a huge family tree back in 1989, and at the time we were in though with several descendants of the Stooke family, including David Furse (who has since died), who had links to two different Stooke families. Back in the early 1990s we were in touch with several others as well, but now there doesn’t seem to be anyone to share interesting family news with. So if you’re interested in Stooke families originating in Devon in England, and are reading this, please leave a comment. I have also started a Stooke family forum on YahooGroups. This is a place for contacting others interested in the Stooke family history. The main feature of a mailing list for posting research queries and discoveries etc, but there are also facilities for exchanging Gedcom and other files, posting photographs, databases and more. Please click on the link to find out how to join. I originally tried to post this on the quick & dirty Posterous blog, but it doesn’t seem to work any more. Why did the Stooke change his name? One of the advantages of the growth of the Internet and the amount of genealogical information available is that one can find things quite quickly that might have been quite impossible when we first started doing genealogy in 1974. The first thing I did when we started was to order my grandfather’s birth certificate, from which I discovered that his parents (and my great grandparents) were William Allen Hayes and Mary Barber Stooke of Bedminster, near Bristol in England. After about 15 years we had managed, mainly through correspondence, to link Mary Barber Stooke to a Stooke family tree at Ashton and Trusham in the Teign valley in Devon, going back to the 16th century. A relative from another branch of the family who lived in Devon went into the Devon record office and checked the records in the tree step-by-step, copying the records by hand and sending them to us by snail mail. But we still did not know about Mary Barber Stooke’s brother and sister.The earlier generations were fairly well documented, the more recent ones were not, or at least the documents were less accessible. We knew she had a sister Sarah, because they were staying together in the 1871 census before Mary Barber Stooke got married. Both their parents seemed to have died by then. It was only much later that we discovered that they had a brother Thomas, and through resources like FreeBMD and FreeCEN managed to discover that he was living in Exmouth, Devon, in 1891, with a wife Mary Ann and two children — Lionel Leigh Stooke and Mildred M. Stooke. And a mysterious e-mail correspondent, known to me only as visionir, told me that Sarah Stooke had married Charles Robert Parker who ran the Colston Arms pub in Bedminster, Bristol, and hinted that he/she had a lot of information on that family, but refused to share it, saying that he/she already had enough information on them and didn’t need any more. I was able to verify some of this information from censuses, but consulting them entailed a 70km drive to the LDS Family History Centre in Johannesburg, and ordering the the films from Salt Lake City if necessary, and waiting two months for the films to arrive. I tried to follow up Lionel Leigh Stooke and Mildred M. Stooke. As more resources came online it became easier and quicker. Their parents, Thomas and Mary Ann Stooke, seem to have died between the 1901 and 1911 censuses. Mildred seems to have married a Leonard O. Meyer and to have had a son Lionel O. Meyer, born in 1918, but of her brother Lionel there was no sign. Had he died? Had he emigrated? There was no way of knowing. And from that clue it has been possible to piece together the story of Lionel Leigh Stooke, alias Stephen Rendel. From knowing next to nothing about him, suddenly we know more than we know even about his sister. He grew up in Littleham (Exmouth), living with the family at 6 Raleigh Terrace. He was there at the time of the 1901 census at the age of 16. He became a civil engineer and went to work in South America. He returned to the UK in August 1914, just before the outbreak of the First World War, under the name of Stephen Rendel, aged 30, and joined the army under that name, giving his birthplace as Hertfordshire. But no Stephen Rendel appears as being born in Hertfordshire (or Herefordshire for that matter) in FreeBMD, or in any census prior to 1911 that I have been able to consult. His appearance at the age of 30 seems to have been his first. After the war he married Elsie Bowden, and they had a daughter Doris in the UK, and on their next journey back from South America, in 1928, they also had another daughter Pamela, aged 1. Doris appears to have married Anthony White in 1941, and Pamela to have married Peter Lewars in 1947. So that seems to be what happened to Lionel Leigh Stooke, but it would be interesting to know why he changed his name, and why he only decided to register the change about 35-40 years later. His sister Mildred is also quite interesting. She seems to appear in the 1911 census as May Stooke aged 23. May was probably Mildred’s middle name, and the address and age are right — she was still living at 6 Raleigh Terrace, Exmouth, with a son Roy, aged 3, and a maid Elsie Hocking. She also had fun with the census form, taking the mickey out of the bureaucrats. Under the “Marriage” column she wrote “Hope to be married shortly” — and she apparently was married a couple of months later. For the maid she wrote under marriage “Awaiting opportunity”, which the dour bureaucrats crossed out and replaced with “Single”. Under Occupation she described herself as “Cook’s Mate”, and her young son Roy as “Guzzla”. The last column was for Nationality under which she described all three as “Devonshire dumplings”. The other branch of this family, of Sarah Stooke who married Charles Robert Parker, likewise seems to have got split up after the 1901 census, with the death of both parents. Edward James, the youngest, may have married Kate Jacobs. 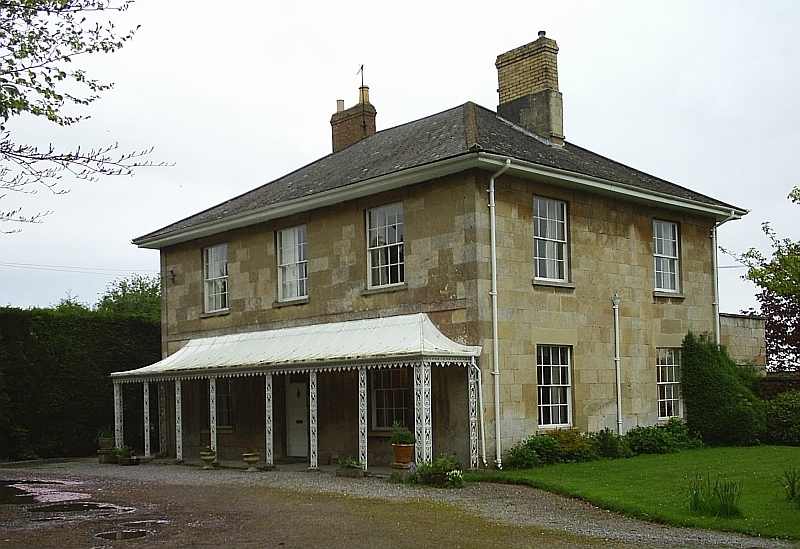 This particular branch of the Stooke family — Mary Barber, Sarah and Thomas — were the children of Thomas Stooke (1815-1868) who was born in Chudleigh, Devon, and married Mary Harriet Hollins, daughter of Richard Hollins. Unlike the Stookes, we know very little of the antecedents of the Hollins family. And if anyone out there is related to these Devonshire dumplings, please get in touch — we love discovering new cousins! And now a descendant of the “Devonshire dumplings” has indeed got in touch, and we have been able to sort out their story a bit. One of the things about the 1911 census entry that is a bit puzzling is that May Stooke describes herself as a “daughter”, and not as the head of the household, suggesting that she is the daughter of an absent father or mother, in which case Roy might have been her brother and not her son. This has indeed proved to be the case. Mary Ann Stooke (born Johnson) died in 1902, and the widower Thomas Stooke married Jane Moore in about May 1905, and they had a son Leslie Roy Stooke in 1908, the “guzzla” of the 1911 census. Thomas and Jane Stooke were staying in a hotel in Blackpool, Lancashire at the time of the 1911 census, where both are described as having been born in “Barnstaple, Bristol” — the hotelier was probably a bit confused when he filled in the census form. And while we haven’t yet managed to discover why Lionel Leigh Stooke changed his name to Stephen Rendel, it appears that his maternal grandfather’s name was John Rendle Johnson. We started the Sandercock/Saundercock family history forum for people of Sandercock descent in October, and by the end of the month we have had some very useful discussuions. Several members have been helped to make new family connections, or to solve mysteries with existing connections. There are now 15 members, representing several different branches of the Sandercock families. If you haven’t yet joined, please respond to this invitation to do so, and pass on the invitation to others who may be interested. The forum is open to anyone with the name of Sandercock, Saundercock and vatiants, or who is descended from Sandercocks, or married to someone descended from them. 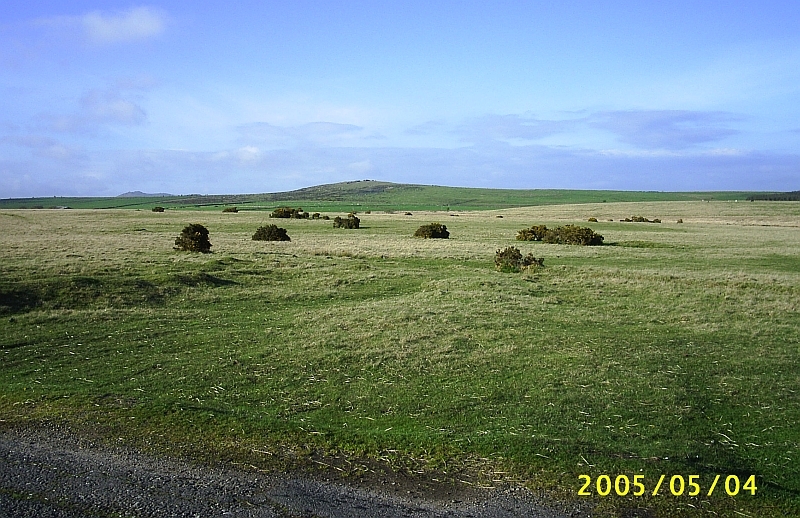 The Sandercock family seems to have originated on the Cornwall-Devon border in south-western England, and have spread from there down and around Bodmin Moor. 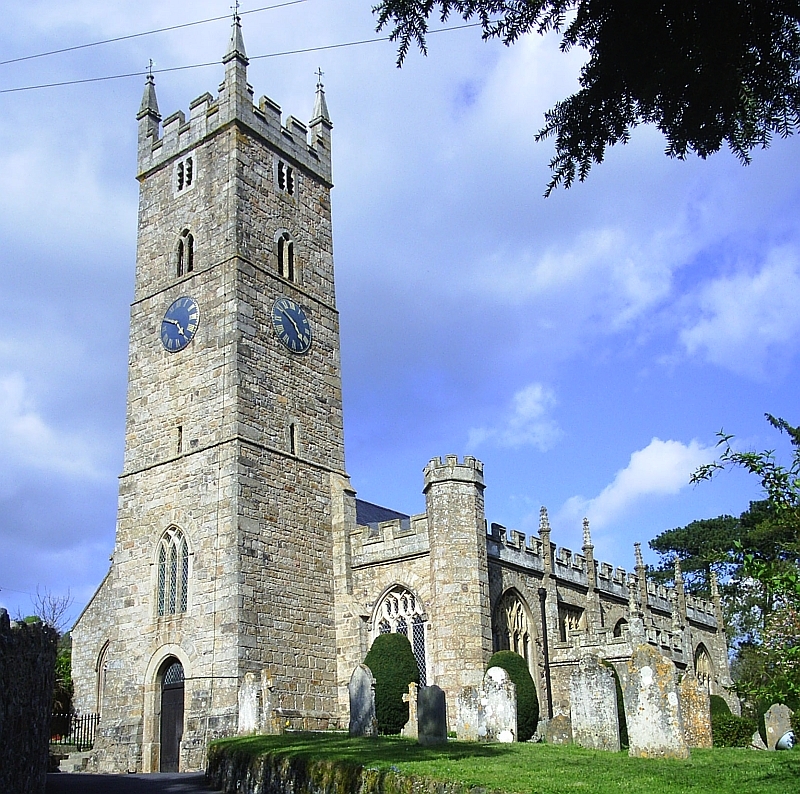 Some of the towns where the family has been established are St Gennys, Poundstock, and Jacobstow in north-eastern Cornwall; Altarnun, Launceston and neighbouring towns in Eastern Cornwall; Cardinham, Braddock, St Tudy and St Teeth on the south and west of Bodmin Moor, and various towns across the border in Devon. Sander is said to be a nickname for Alexander, and so Sandercock probably originated as meaning “son of Alexander” — Sanderson is another name with a similar derivation. We hope by pooling our resouces, to track the various families back to the original hypothetical Alexander, though of course there is always the possibility that there were several unrelated ones whose children were given the epithet Sandercock. I’ve started adding some information about the Stooke family on our Wikispaces pages. My great grandmother was Mary Barber Stooke who married William Allen Hayes, and they lived first in Bedminster, near Bristol, and later at Axbridge in Somerset, where they kept the Red Lion Hotel. Mary Barber Stooke’s father Thomas Stooke came from Chudleigh in Devon, and most of the earlier generations came lived in the Teign Valley in Devon.